The most successful exhibitor in the history of the RHS Chelsea Flower Show is once again teaming up with the most decorated garden designer in the show’s history. 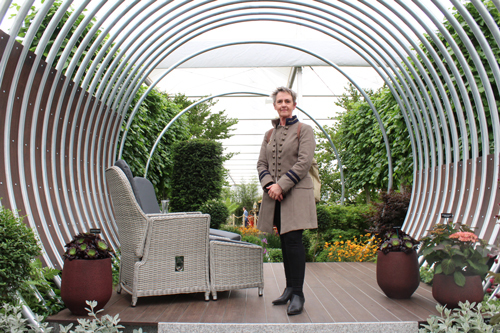 Hillier hopes to make it a 73rd consecutive gold at the 2018 RHS Chelsea Flower Show, once again enlisting the expertise of garden designer Sarah Eberle, (pictured below on the 2017 Hillier exhibit) for their 2018 RHS Chelsea Garden exhibit. Sarah has designed the Chelsea garden for Hillier since 2016. Sarah has won 15 RHS Gold medals, nine of which were awarded at Chelsea and is the most decorated designer in Chelsea history, having won gold in more categories than any other designer. She is also the first designer to achieve a ‘treble double’ of golds – three years in a row of two gold medals for her gardens, which she accomplished in 2017. Sarah is hoping to further that total with her 2018 Hillier design and help the renowned nursery maintain its position as the record holder for consecutive gold medals at Chelsea, achieved with a remarkable 72nd won in 2017. Hillier have exhibited plants in some form for over 100 years at Chelsea and is the platform from which the company launches many of its new plant varieties, showcases the vast variety of plants grown on its nurseries and demonstrates a continuing passion and commitment to horticulture. George Hillier, Head of Property at Hillier comments that their Chelsea plans are well underway and the designs for the garden are flourishing: “Sarah is working closely with our nursery team to ensure the very best plants are grown and selected, and we can’t wait to see the garden come to life in May. It may seem a while yet but showtime will soon be upon us.” he said. 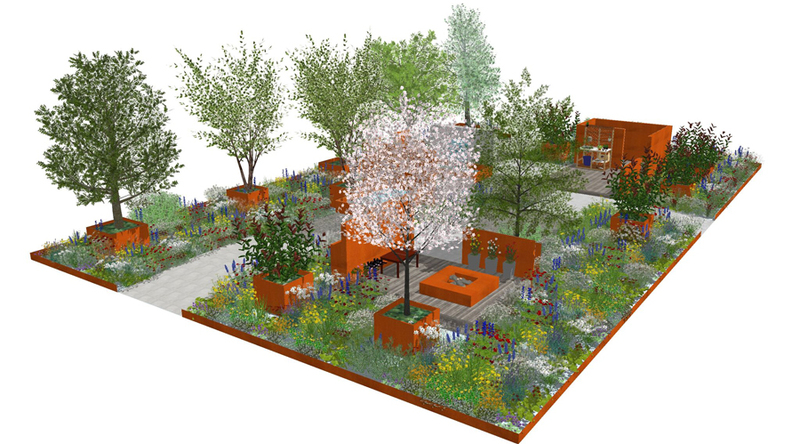 The 2018 Chelsea garden – STIHL Inspiration – will take on a more rustic theme than previously featured exhibits with corten steel throughout, and orange and blue flowering plants adding warmth alongside the traditional feature of Hillier’s mature trees. To boost interaction with the exhibit, Sarah has deliberately created a walkway through the garden that will provide opportunities for greater interaction with all elements of the exhibit. This year, STIHL, the world-famous garden tool manufacturer, will be a sponsor of the Hillier garden. The theme of the 2018 exhibit is inspiration and the design will see the two companies uniting to encapsulate the “inspiring future generations” ethos of Hillier which has run through the company since its formation 150 years ago. Discussing the design, Sarah Eberle, said: “It often feels such a shame that gardens have to be seen from a far. This year we’ve decided to counter that! We’ve opened up the garden to allow people to interact with it and take inspiration for every aspect so they can get up close to the planting, see all the intricacies, and smell the flowers! With a love of countryside, and the inspiration that rustic materials brings, this garden aims to excite and inspire visitors as to the possibilities of their own plot“. In the meantime, we wish Sarah and the Hillier team every success as they prepare for Chelsea 2018.